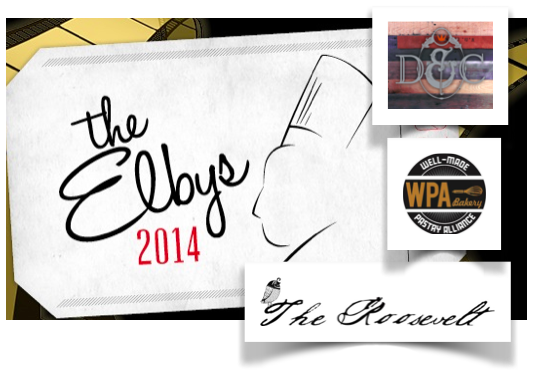 Dutch & Co., The Roosevelt, and WPA Bakery are 2014 Elbys awards nominees, Richmond Magazine’s annual recognition of “excellence in the Richmond region’s restaurant community”. Dutch and Co. has been nominated for “New Restaurant”, competing against Dinamo, Estilo, Rappahannock, and Saison. Michelle Peake of Dutch & Co. is up for “Front of House Manager”, along with Michele Jones of Pasture, Aline Reitzer of Acacia mid-town, and Emilia Sparatta of Heritage. Phil Perrow of Dutch & Co. has been nominated as “Rising Culinary Star”, with Mike Braune of Secco Wine Bar, and Travis Milton of Comfort, and Craig Smith of Toast and Estilo. Dutch & Co. and The Roosevelt have both been nominated for “Beverage Program”, along with Heritage, and Saison. The Roosevelt has been nominated for “Restaurant of the Year”, with Curry Craft Indian Restaurant & Bar, Heritage, and Rappahannock. Lee Gregory of The Roosevelt is up for “Chef of the Year”, as are Dylan Fultineer of Rappahannock, Owen Lane of The Magpie, and Joe Sparrata of Heritage. David Rohrer of WPA Bakery, Sara Ayyash of Lemaire, Winburn Carmack of Heritage, Pierre Tocco of The Desserterie are all nominees for “Pastry Chef/Baker”. In addition, Michelle Williams of Richmond Restaurant Group, owners of The Hill Cafe, is up for “Restaurateur of the Year”. Other nominees include Ed Vasio of Mama ‘Zu, Edo’s Squid and Dinamo, Jason Alley of Comfort and Pasture, and Travis Croxton of Rappahannock. The awards ceremony for the Richmond’s burgeoning restaurant scene will be Sunday, January 26 in the Cheek Theater at the Virginia Museum of Fine Arts, with a reception to follow. Net ticket proceeds will benefit the nonprofit Shalom Farms, Slow Food RVA, Tricycle Gardens and the VMFA Foundation. Those of us unfortunate enough to live near Michelle Williams’ “restaurants” should get a vote, too. Some of her staff and establishments engage in destructive and illegal behavior. If want them to stop, or want her to even abide by agreements that she herself made, her staff harasses you, her lawyers threaten you, and your home is vandalized. That’s who Michelle Williams is. @ Will, please provide examples otherwise your post has no credibility. We received our copy of “Richmond Magazine” at work today and was surprised that Dutch & Co. did not win a single category for the Best in their Best and Worst issue. Has the newness worn off? At the same time the Hill Café use to win awards often but how many years has it been since they have been recognized for anything?